I hope that you are enjoying your weekend! We are beginning to get our indian summer here in San Francisco. After months of temperatures in the 50's and low 60's and drizzly mornings, we have begun to see the sun! So, naturally I would start to think about making Christmas ornaments :) to put in the shop. I always like the contrast between the rough around the edges and the shiny and refined. 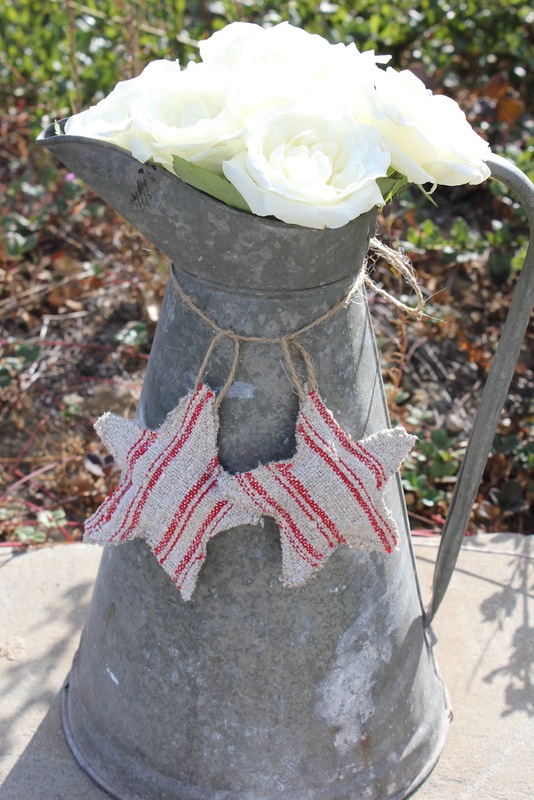 I thought that these antique linen stars would be beautiful on a Christmas tree against the white lights. I read a book many years ago by Deepak Chopra called "The Seven Spiritual Laws of Success." One of the things, amongst a few, that I took away from this was the law of giving. As you can guess he writes mainly about karma and the beauty of the theory that "to give is to receive." He states that you should never show up at someone's house empty handed. He does not mean that you have to run out and buy a $30 floral arrangement every time you drop by someone's house for a cup of coffee. He says that it can be a quick prayer asking for the health and happiness for the family who inhabits that home. It can simply be a wish for their well being. I thought about this while making these stars to put in the store. So, I wrote a little wish on a piece of paper and inserted it into the stars before stuffing and sewing them up. They are simple, such as "love, health, joy..." etc. I thought that these would not only be great to adorn a tree, but also tied to a package. You could tie a few to the backs of chairs if you were having a dinner party. I am a big fan of having a stock of hostess gifts around the house. I like to take something that is unique. I think that bringing a set of three to a hostess as a small thank you would be lovely. I have also been busy restocking the shop with some grain sack pillow shams. 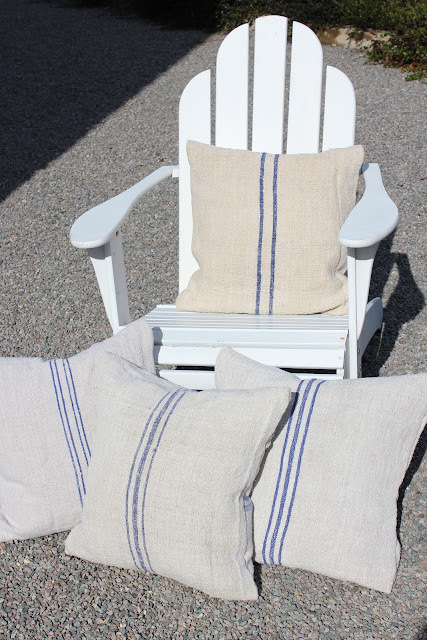 I was running low for a while and just found some great blue striped sacks. I want to thank all of you who read my blog. Your kind comments always make me smile and encourage me. I honestly love to hear from you and appreciate that you come back to read my posts. 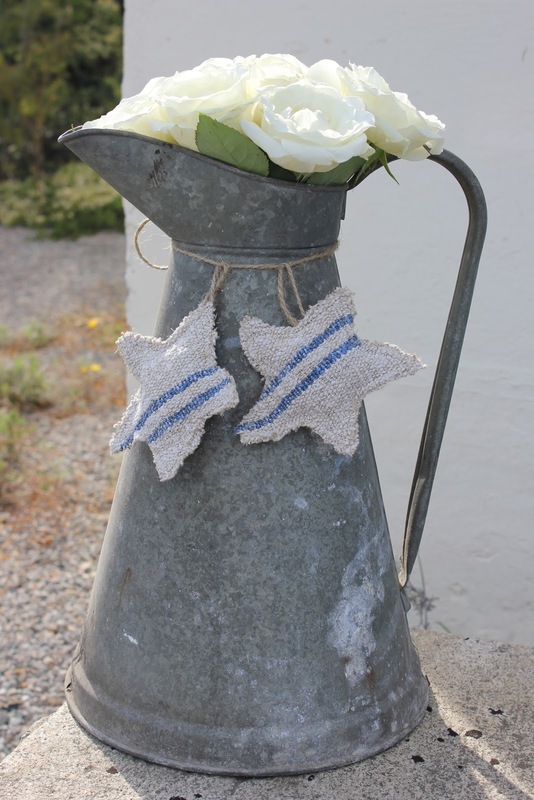 Darling Mchele your grain sack pillows are beautiful, as the little stars!Hope you hada peaceful sunday! Such sweet little star ornaments! Too cute! So lovely Michele!! I adore the Christmas ornaments!! I have been watching the weather in San Fran and I've been so jealous of your wonderful temps. San Fran has always been my favorite place. My hubby and I have been talking about moving there lately, so we'll see. I have not read his book, but it does sound like a good one! I like how you incorporated that idea into your Christmas ornaments too. So clever! Why you can come visit me anytime since you have the best hostess gifts. Ha! As always, love your grainsack pillows too. I don't have any and really should get some someday. Michele, love the Christmas stars oh so French, and those pillows I am crushing on them, love my visits I leave so inspired by all you create over here. What a wonderful idea to put a beautiful thought into the stars! Your stars are wonderful. It's the perfect gift as you mentioned, and would be so sweet to give any friend whose providing dinner or coffee.